For many stands, sculpture is increasingly becoming the focal point for garden design. 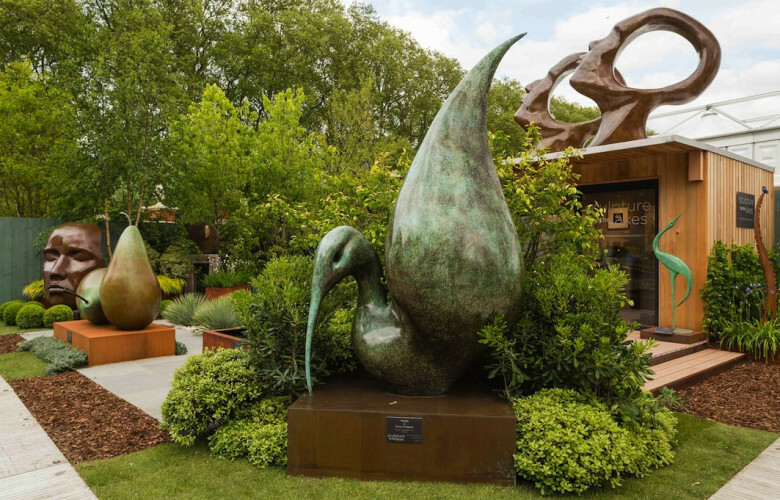 First-time exhibitor at the Chelsea Flower Show, Sculpture by the Lakes, created a garden, which emulated the planting scheme at their sculpture park in Dorset. Just as in the sculpture park, the planting palette is designed to complement and enhance Simon Gudgeon's work, the greenery follows the natural hues of the sculpture providing a frame and structure for some of his monumental works such as 'Thoth' and 'Search for Enlightenment', the latter of which is also displayed in Hyde Park. A welcome addition to the Great Pavilion was the Tower of London poppies artist Paul Cummins' sculpture 'Candy'. At 26ft high, the work is covered with 2,300 hand-painted ceramic tulips and inspired by the 17th century 'tulipmania' in Holland, where single bulbs were exchanged for the price of houses. Paul Cummins' 'Blood Swept Lands and Seas of Red' saw 888,246 poppies flood the moat at the Tower of London last year, one for every British and colonial military fatality in World War One. This installation, thought to have been seen by about 5 million people, struck a chord with the public. Cummins' installation was widely interpreted as an attempt to understand and commemorate the sacrifice of so many, a national loss, which for most is incomprehensible. It is in this way, that sculpture has penetrated our everyday lives and become a real presence within public settings: Yorkshire Sculpture Park was the Art Fund Museum of the Year last year (2014), Sotheby's exhibition 'Beyond Limits' prepares for its tenth year at Chatsworth House this September and London's new sculpture trail 'The Line' opens on 23rd May 2015, where ten works by artists such as Damien Hirst, Martin Creed and Gary Hume will be installed between the O2 and the Queen Elizabeth Olympic Park. The Fourth Plinth in Trafalgar Square is a key example: rather than settling permanently on one idea or figure, commissions for the plinth remain on a rolling programme. Hans Haacke's 'Gift Horse' is currently on display, which depicts a skeletal riderless horse. A tribute to economist Adam Smith and English painter George Stubbs, the horse has also appealed to many younger viewers as a nod to J K Rowling's thestrals. However, this is perhaps the beauty of the public sculpture: these works truly represent the 'art for all' ideal, within the public domain the artistic vision of these sculptors belongs to us all.